The Trump administration did something over the long holiday weekend it has rarely done for most of the president's tenure. It actually acknowledged global climate change is real and its effects on the United States both now and in the future are dire. But Friday's release of the congressionally mandated report was stuffed into the middle of a Thanksgiving weekend on one of the busiest shopping days of the year. As The Post's Brady Dennis and Chris Mooney report: "Several people involved in the report said its release originally had been planned for early December, but after a behind-the-scenes debate in recent weeks about when to make it public, administration officials settled on Black Friday." If the intent of that publication date was to keep the climate report out of public view, the plan did not quite work. Major news organizations still featured the report prominently in print and over the airwaves, even days after its publication. If anything, dropping the report on Black Friday just gave Democrats another point of criticism of the administration and generated even more headlines. "The Trump administration may want to bury this report so that it doesn’t get attention," Sen. Edward J. Markey (D-Mass.) said in a statement, "but we can’t bury our heads in the sand to the threat of climate change." The National Climate Assessment, which is the product of scientists from 13 federal departments and agencies, found that the effects of climate change have already arrived in the United States. They include an increasing likelihood of events like deadly wildfires and debilitating hurricanes that have dominated the news in recent months. The wide-ranging findings contained in the 1,600-page report gave regional papers the news hooks they needed to give the story prominent placement. Out west, papers such as the Idaho Statesman, Wyoming Tribune Eagle and Arizona Daily Star wrote headlines focused on the rising threat of wildfires. Back east, papers in coastal cities such as the The State in Columbia, S.C., and the Portland Press Herald in Maine featured front-page photographs of the destruction brought by flooding from hurricanes over the past two years. Major national and regional newspapers such as the Boston Globe, Chicago Tribune, Mercury News, Miami Herald, New York Times, San Francisco Chronicle, Seattle Times and Washington Post carried stories about the report on their front pages as well. The report also gave television journalists at NBC, CNN and even Fox News the opportunity to ask Republican politicians — who rarely if ever bring up climate change on their own — about the looming economic and ecological crisis as well. Sens. Mike Lee of Utah, Ben Sasse of Nebraska and Joni Ernst of Iowa were each asked what Congress could do to address the economic toll climate change could extract on the nation that was described in the report.Under the worst-case scenario, labor-related losses by the year 2090 as a result of extreme heat could total an estimated $155 billion annually while coastal property damage could go up to $118 billion. While each senator to some degree acknowledged the climate is changing, they all brushed aside the need for the aggressive action, like placing a price on carbon dioxide or reinstating an Obama-era plan to curb greenhouse-gas emissions from coal-fired power plants. "Any time that we are putting regulation out, we need to always consider impact to American industry and jobs," Ernst said on CNN's "State of the Union." The White House played down the findings by saying the report was "largely based on the most extreme scenario," according to the Times. On Twitter, Trump himself dismissively asked "Whatever happened to Global Warming?” when discussing a cold spell gripping the Northeast over the weekend, daily weather with long-term climate trends. In a call with reporters about the findings, federal experts were repeatedly asked about the timing of its release. "For the most part, they demurred, saying that in part the report was finished early and that they wanted to make sure it was out ahead of both an American Geophysical Union gathering next month, as well as a major international climate conference in Poland around the same time," Dennis and Mooney write. "Rather, they implored reporters to focus instead on the contents of the report, which they said had not been tinkered with by administration officials." Scientists are more certain than ever that climate change is already impacting the United States, and that it is going to be very expensive. 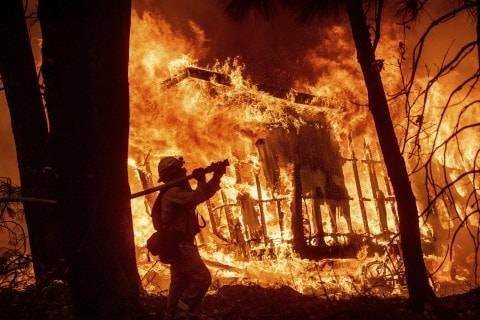 — Speaking of wildfires: The Camp Fire, the deadliest wildfire in the history of California, has finally been fully contained. As of Sunday, nearly 14,000 homes burned in 17 days and more than 153,000 acres were charred, The Post’s Cleve R. Wootson Jr. reports. That is an area the size of Chicago. More than 1,000 firefighters helped beat back the blaze. Still, authorities believe the death toll, currently at 85, will continue to rise as officials continue to look for the 296 people still unaccounted for. — “Thank you to Saudi Arabia”: In addition to his tweet about global warming, the president twice touted dropping oil prices over the Thanksgiving break. He tweeted Sunday that it’s “so great that oil prices are falling,” thanking himself for the feat. And last week, he thanked Saudi Arabia too despite a recent conclusion from the CIA that Saudi Crown Prince Mohammed bin Salman ordered the assassination of Washington Post columnist Jamal Khashoggi. — Moving on to Iraq: "President Trump twice raised to the Iraqi prime minister the idea of repaying America for its wars with Iraqi oil," Axios reports. After Trump brought up the controversial idea out of step with international norms, then-national security adviser H.R. McMaster chided the president. Environmental Protection Agency Acting Administrator Andrew Wheeler and California Attorney General Xavier Becerra will be interviewed at The Washington Post for an Energy 202 Live event on Wednesday. The Senate Environment and Public Works Committee holds a hearing on addressing America’s surface transportation infrastructure needs on Wednesday. The Atlantic Council holds an event on "The State of Ukraine's Energy Sector" on Wednesday. The Senate Environment and Public Works Committee holds a hearing on the nomination of Alexandra Dunn to be assistant administrator of the Environmental Protection Agency on Thursday. The Senate Energy and Natural Resources Energy Subcommittee holds a legislative hearing on Thursday. Senate Armed Services Committee holds a hearing on the nomination of William Bookless to be principal deputy administrator of the National Nuclear Security Administration on Thursday. The Women's Council on Energy and the Environment holds an event on incorporating intelligent water systems in U.S. water utilities on Thursday. Former Energy Secretary Ernest Moniz speaks at an Atlantic Council event on "Investing in Natural Gas for Africans" on Thursday. — Waves in the clouds: The National Weather Service station in Cheyenne, Wyo. writes these "Kelvin-Helmholtz waves" are caused by "an instability that forms where there's a difference in wind speed and/or direction between the top and the bottom of those clouds." Here's a great picture of Kelvin-Helmholtz waves over Cheyenne this evening around sunset.